Am back in Lima, fighting off a 24-hour jungle bug. You'd think an evening spent in the grip of fever would spark Stokeresque visions and creativity, but in sad fact I feel all mundanely uninspired. So click if you dare, but I fear this travelogue will be less entertaining than usual. Iquitos: a strange place. The largest city in the world (pop. circa 400,000) with no road or rail connections - everything and everyone must come or go by air or riverboat. This lends it a real frontier-town feel, which the DEA helicopters, downtown cafes dominated by a small crew of dissolute British expats, and gutted turtles and caimans (gators) for sale in the local market do nothing to dispel. Still, it's civilization; it has an international airport, banks, pharmacies, a cinema, cheap Internet cafes, a five-star hotel, and a thriving tourist industry, the last focused mostly on expeditions to lodges set in jungle proper. It's not at all apparent when in the middle of Iquitos that you're surrounded by hundreds of thousands of square kilometres of raw primary rainforest, but it's very obvious when you fly in. From a window seat high above, much of the Amazon basin has only two colours: the swirling brown ribbon of the Amazon and its tributaries, and the endless sea of deep blank green that surrounds it. La Selva, the jungle. 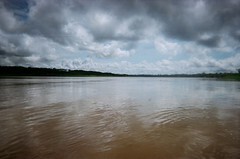 But don't confuse the Amazon River with exotic remote wilderness. Exotic, maybe, but make no mistake, Earth's mightiest river is also a superhighway, dotted with corrugated-roof towns and thatched-roof villages, lined by banana and rubber plantations, plied by countless vessels ranging from handmade one-man wooden canoes through ancient riverboats carrying hundreds of passengers up to modern ocean-size merchant ships. The river waxes and wanes with the year, right now wide and thick and muddy. The main causeway is 30-plus metres deep, but sandbanks are frequent and unmarked save for the occasional deadhead log. Vegetative flotsam is everywhere, carried downstream by a current that is surprisingly strong given that the river drops all of 200 metres during its 6,500-kilometre journey to the Atlantic. We - myself, a pair of Yanks, a pair of Brits - travelled upriver from Iquitos to Muyunas Lodge, on a small tributary called the Yanayuca River about 200km from Iquitos, surrounded by primary rainforest, next to a tiny village. It was the atmosphere, more than anything else, that made the place. Oh, sure, we captured a baby caiman, we hacked our way through fire-ant-infested swamp to go piranha fishing1 in a remote lake, we trekked through primary rainforest past enormous trees and howler monkeys and ant nests the size of SUVs, we saw sloths and iguanas and tarantulas and blue-morpho butterflies and an amazing number of vultures and hawks and other birds of prey, we swam in the Amazon with gray (small) and pink (large) freshwater dolphins, and all that was very cool - but it was the feel, the cacophony of jungle noises that echoed all night, the towering trees and ferns, even the bazillions upon bazillions of biting flies and ants and mosquitos and spiders, the sense of being in a wild place, that I liked the most. Which is pretty funny because it wasn't in fact all that wild. There exists untouched jungle in the Peruvian Amazon - and not just national parks, there are still tribes in the Madre de Dios region entirely uncontacted by the rest of the world other than the running blowguns-spears-and-arrows battle they wage against illegal loggers -but getting to real heart-of-darkness wilderness, as with everywhere else, while possible, is expensive, time-consuming, and difficult, as per my dilemma below. But the Yanayuca is all the more fascinating because it is inhabited and accessible. The village next door had wooden stilt houses and thatched roofs, used plastic buckets and metal pots, wore Western clothes, but hunted or fished or gathered pretty much all their food. Mostly a subsistence existence, but its inhabitants - as with the net fisherman we met on Lake Piranha - occasionally catch and salt canoeloads of fish, paddle the three days to Iquitos, sell their fish in the market, and pick up what modern equipment and/or decorations they can buy with the proceeds. There is a church, and a school, and a priest and teacher sent from Iquitos, although some months that month's teacher fails or refuses to come and the school is empty. And they play football. Everybody plays football, young and old, male and female, the village is literally built around the football field, and every Saturday everyone in the nearest dozen villages gathers in one place for a huge tournament, and the champion village wins a hundred US dollars. It's a thriving community, the little river and all the villages and individual houses on its banks, and there is a constant stream of canoe traffic up and downstream, and it's fascinating watching ancient and modern all mingled together. We had a guide. Quite a guide. Octavio, an Indian, "born in the jungle, like a turtle," he said (and gave me a dirty look when I pointed out that turtles hatch from eggs.) Mid-fifties, small, pot-bellied, nicknamed "Burro" (Donkey), and completely extraordinary; seven-language linguist, village chief, occasional guide, near-superheroic master of the jungle. Can spear fish from five metres in water so brown it seems opaque to anyone else. Also expert with bow and blowgun. Can call nearby birds and monkeys to his side by eerily expert imitation of their calls. Can spot iguanas, sloths, snakes and anteaters in the thickest of brush. Can use jungle flora and fauna as pharmacy, arsenal, water source, pantry, construction material, and who knows what else. Knows everyone in a 100-km radius of the Yanayuca. He even whips up a mean chichuwawa sour (a much-better-than-it-sounds combination of fresh sugarcane rum, wild honey, egg whites, lime juice, and two types of tree bark.) He even plays guitar. The man is downright cinematic. A speedboat took me from Muyuna Lodge and back to Iquitos, where for an hour I sat in Ari's Burger (central meeting place for the city), smoked (I've taken it up again, for travel purposes), drank beer (Pilsen, which is, eh, okay I guess) and pondered a traveller's dilemma. 1 Quite easy, albeit a little painful; just dip your toe in the water and it inevitably comes out with a dangling piranha attached. Surprisingly tasty. It is indeed better to eat than to be eaten. The same is true wherever I look. I'd like to take the hard road - perverse, maybe, but true - but around here the hard road never seems to lead anywhere worthwhile, and doing it for its own sake just seems pointless. I guess that's part of what I liked about West Africa and PNG, that there was no easy road. Granted, I could have hired guides and gone on a far-more-intense jungle expedition, say carving an overland trail between two tributaries, hacking out campsites with machetes every night...but it would have been just me and a guide or two, and I'm quite sure that would have gotten old in a real hurry. ...so, in the end, I quailed away, back to the easy road, and while it's the sensible decision, I still kind of regret it. Sure, I'll be taking the occasional overcrowded chicken bus, but fun as it is, for me there's no longer any new-frontier thrill to be found in the well-worn backpacker route. 2 OK, that one I could do myself, and would be genuine no-questions-asked adventure, and one of these years I'd love to give it a shot...if the Congo ever recovers from blood-drenched anarchy. Anyway. I feel fully recovered from my jungle bug, and back to the soft-option gringo trail I go. Tomorrow, Cusco; in a few days, the Inca Trail.